Steve Jobs, iPad 2 launch event March 2011. I’m not above doing a feeds and speeds comparison. 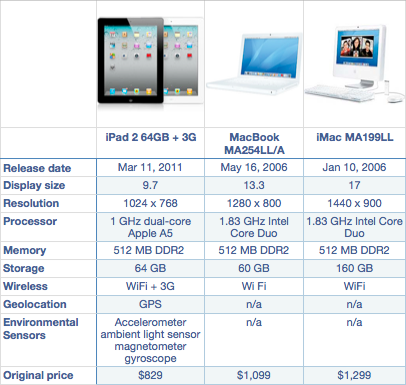 All the products above have dual core processors, 512 MB of memory. The iPad processor is a bit slower. The iPad also has a slightly smaller resolution screen than a MacBook from mid 2006. However, unlike the others, the iPad has cellular broadband connectivity, loads more sensors, and a battery that will last at least 5 times longer. It’s also a lot cheaper and a lot smaller. Although five years old, nobody would question that the MacBook or iMacs shown above are still computers. They still run the latest versions of OS X and are probably still in widespread use. 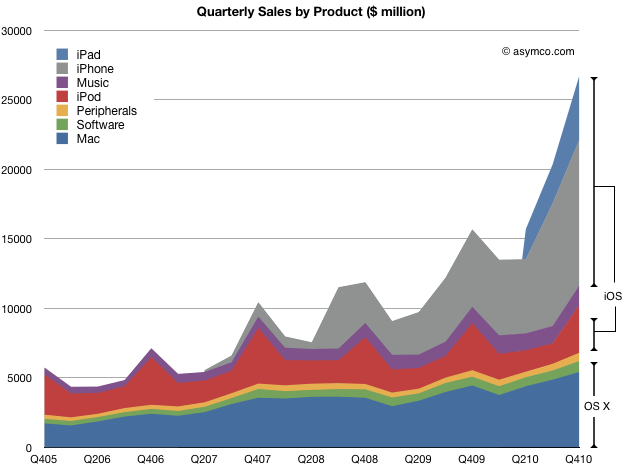 The iPhone and iPad generated $15 billion of revenue last quarter. In addition, iPod touch generated about $2.3 billion, implying that iOS based devices were responsible for sales of $17.3 billion. To put that in perspective I drew this chart which shows not only the sales by products but a rough representation of share of the two OS variants Apple uses to power its products. And so we come to the question of Chrome and H.264. First off, it should be clear that video codecs are infrastructural technology. They are commodity algorithms which are generally invisible to users. They are ubiquitous and are “shared” in the sense that they are available for licensing often without much in terms of cost. So they don’t really offer strategic advantage to the adopter. Some may end up adding slightly more to a cost structure than others, but not in a way that determines strategy. Flash on the other hand is not infrastructural. It is not shared, it is not invisible to users, it is a brand, it has a significant business model and market value. It is sustaining to Adobe. So the argument I’ve heard against Google’s decision is that they are using an infrastructural technology decision (a new video codec) to placate or sustain Adobe Flash, at the expense of Apple, a potential or perceived rival. If this was the plan, it would be a strategic mistake. via IBM Survey Says Mobile Apps Will Dominate Enterprise – Venture Capital Dispatch – WSJ. However, developers are very good at spotting long term technology trends. It was developers who championed the early internet and it was developers who saw potential in social networking. To see a survey of developers confirm that mobile devices will dominate IT, in contradiction to most incumbent strategies, is encouraging. With QNX now firmly roadmapped at RIM and Android spreading among vendors like a virus, I wanted to point out that these operating systems share one ancestor: Unix. Technically Linux, which underlies Android, among others, is walled off from Unix from an IP point of view, but the philosophical and architectural lineage goes back to 1969’s Unix. It was an amazingly well thought-out operating system which has stood the test of time mostly due to its modular architecture. It was not always clear that Unix would make it this far, and in many ways it was written off. At one point in time, J2ME (now Java ME) and WAP were the starting points for a discussion on mobile strategy and the web. Then, for a brief period of time, you talked about HTML/CSS. Now, for a growing majority of mobile strategies that don’t require a global presence on widely varying devices, the discussion begins with iPhone. Smart client is now iPhone app, and in many cases, the app is primary to the experience, not secondary to the browser. And iPad app may soon replace iPhone app as the starting point. Frankly, as the adoption rate of iPhone increases and if iPad follows suit, it will become increasingly difficult to argue in favor of a starting point other than iPhone OS. The NPR iPad app, for one, provides a much more pleasant user experience than NPR.org. 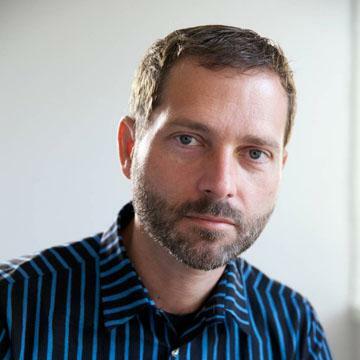 via Cameron Moll: Designer, Speaker, Author The Mobile Web vs. the Objective-C Web.